Good morning. I love being home. This congregation raised me. I came to it in 1995, deeply wounded from my Catholic excommunication years before. Early on, I fought with a member during a movie when I thought I heard dogma and he emphatically denied it. I refused to sign the book for years, just waiting for someone to roll out the rules, the values that I would not accept. But it didn’t happen. In January, 2000, I decided to bite the bullet and make official what everyone thought was already a fact: I signed the book and proudly identified myself as a Unitarian Universalist. This church gave me a sense of belonging, of being loved, accepted and challenged. At that time, in addition to joining this community I also knew that I was burnt out of my profession as a neuropsychologist, ready to make a change but to what I did not know. For a while I floated in ambivalent ambiguity. Nevertheless, I was very active in the congregation. I cofounded the youth group, joined the social justice team, was elected to the Board, and delivered many secular sermons both here and in neighboring congregations. I loved it! After we moved from what is now called the Alive center down the road to our present location, the chatter about possibly hiring a minister increased in volume and intensity. I ranted along with many others: “What do we need a minister for?” A few of our elders suggested that we try out ministry by having sporadic guest preachers. We did that for several years. Now this next part of my story might seem slightly incredible to some of you, given how quickly the world has changed in the last fifteen years, but this is what actually happened to me. Suddenly a light flashes from the sky just around Saul, and he falls to the ground at the sound of a voice. These were the shocking, unexpected words that would change Paul’s life forever. And so it was with me…the same, yet different. One Sunday we had a visiting minister: the Rev. Angie Theissen was in the pulpit. She was not the first female preacher that we had heard, but, all of a sudden, a light bulb went off in my head, my heart rate increased, and I received the prophetic meaning of my insight. “Oh! A woman can be a minister.” From that moment, I harbored a growing, but private, seedling of desire and confidence. This was my calling! Within weeks of that awareness, two of our elders, asked me THE question: “Deane, have you ever thought of becoming a minister?” And of course, I listened. That fall I entered seminary. Meadville Lombard Theological School is in the Hyde Park area of South Chicago, adjacent to and affiliated with the University of Chicago. I was in a unique position because I had never read the Bible. (Catholics were not encouraged to do so, and after I was told to leave the church I had no desire to read it.) Also, I came from this congregation with both an extremely secular vision and without a minister. In fact, I had rarely seen a real minister preach. But wonderfully, ministry was to be my second career. I was studying because I had found something, that from the depths of my heart, I really wanted to pursue. I loved seminary. 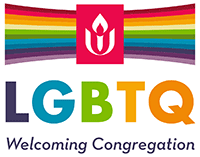 At that time, and ever since, Meadville Lombard, as well as the entire Unitarian Universalist Association, had entered into a transformative commitment to become an anti-racist, multicultural faith community. That was right up my alley. You see, black/white discrimination had always been a major interest area for me. Perhaps it started when I was a pre-schooler. I was at a birthday party, and someone had given the birthday girl a doll with a large skirt that lets you turn it two different ways and see two different people. 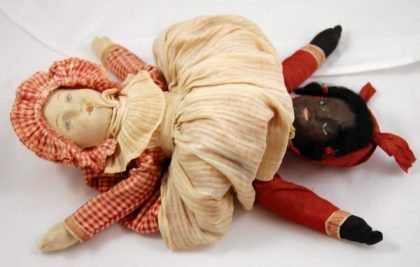 Although the tag says that it is a Caribbean reversible doll, I’ve been told that what it doesn’t say, is that the two dolls represent the two large ethnic groups on the island. At this party, the birthday girl had received a doll that was white one way and black the other way. I thought it was wonderful, I liked it so much, so, I took it! Just walked right out with it. And of course, I got caught, had to return it, and—I think—even apologize. In kindergarten or first grade, I invited a friend over to play. She told me that she would like to but she knew that she would not be allowed to play at my apartment. She came, we played, and sure enough, my mother got phone calls that the situation should not happen again. My mom told me that I would have to play with my friends at school. My black friends, that is. I never invited another playmate to the apartment. In White Plains, New York, our street was integrated and our schools were integrated. In fact, the United Nations sent visitors to our “model” schools. Since our at least middle-class town was approximately 60% white and 40% black, we must have looked like the well integrated community that civic leaders hoped for. I don’t know; I was a child, with a child’s interest level. In high school, my best friend was black, but passed for white. I knew but it took another few years before she admitted it to the rest of the world. The young man behind the soda fountain, though, kept prodding her, “You’re black aren’t you? You know that you’re black.” And she would answer, “No, really, I’d tell you if I was.” So I know that it wasn’t that idyllic to be black, even in our town. For entertainment, my friends and I would watch TV and count the number of black people in the shows and the commercials. If a company never had a person of color on the air, we would boycott them. It was a good effort, even if we were not consciously aware of the concept of institutional racism. If somebody had called me a racist, I would have angrily rebuked them. And so I lived my liberal life, traveling to Washington DC for rallies, experiencing the Yellow Springs dispute with the white barber who refused to cut black men’s hair, stating that he did not know how; adopting a black baby girl and living with the racism of her growing up in this conservative town. Two examples. Drama Club: Of course, you will never get a lead. We can’t have a situation where a white boy would have to kiss a black girl. Dance School – everyone always has to wear “flesh” colored tights. You know not everyone’s flesh was “flesh” colored. All of the legs painted on the dance school walls were white. How we wanted to go there at night and change some of those legs to match the actual legs in class. So at Meadville Lombard Theological School, anti-racist reflection, discussion and work groups were engaging for me. I had no idea of my own racist tendencies. My first inkling came in my last year of seminary. One of our requirements was Wednesday evening vespers, a worship service in which a seminarian or guest designed and delivered the readings and sermon. On this night Michael, a tall, slim, blond, blue-eyed second-year student gave the reading. He delivered it first in English and then repeated it in German. To my surprise, my immediate, gut level, visceral response was anger, real bodily felt anger that this Aryan supremacist was invoking a mother tongue which had been tarred with hate and bile. I was repulsed. And all in the span of five seconds! Wow! Where did that come from? No one had ever insinuated or told me to hate Germans, but there it was, a product of a youth that had been through war with Hitler and his superior race initiative. I was totally unaware of my feelings. I had never had a discussion about Germanic ideology; I came from a town in which, as far as I know, I did not know one German person, and in school, blessed be, we never got up to the 20th century so we hadn’t studied WWII. Still, there was a layer deep inside me that had absorbed the biases of a generation. It was an acculturation process of which I was totally unaware, and yet—and yet—it affected my emotional and behavioral response. There it was. Implicit racism. As you might expect, broadly defined, implicit racism, refers to an individual’s use of unconscious biases when making judgments about people from different racial and ethnic groups. Implicit biases are the attitudes or stereotypes that affect our understanding, actions, and decisions. The key word is unconscious. Unconscious biases are activated involuntarily and without an individual’s awareness or intentional control. So you cannot study them in the abstract, search for them in your soul, or work to correct them. They are a product of your life’s experience. They are pervasive. They do not necessarily align with your professed values and beliefs. They usually favor your own particular subgroup, but, here is the good news: once discovered, they are definitely malleable. Once conscious of them, you can then challenge your biases. Implicit racism can make your life miserable. I remember teaching computer skills to a young Asian girl. Her mother confided in me how hard it was for her because, even though she had been born in Kentucky and had lived here all of her life, at the age of 11, she was still a foreigner and, as such, found it very hard to make friends. So sad, and yet I found that I, too, had been treating her as different; a good kid, but different. Shall we talk about telemarketers or physicians? My new physician is from India. I had already previously encountered and worked through my bias that Indian doctors could not be as well trained as American doctors. Instead, my fear before meeting her (no, I never was negatively biased against female doctors as some of us are) was would I be able to understand her. There is a difference between bias and accountable concerns. Sometimes we have both. The 1997 General Assembly urged Unitarian Universalists to examine carefully their own conscious and unconscious racism as participants in a racist society, and the effect that racism has on all our lives, regardless of color. What’s off or funny about that resolution? Let me repeat it: The 1997 General Assembly urged Unitarian Universalists to examine carefully their own conscious and unconscious racism as participants in a racist society, and the effect that racism has on all our lives, regardless of color. How does one examine one’s unconscious racism? If it is unconscious, you are unaware of it. The actual resolution needs a little tweaking, but the work is real. Once awareness breaks through, either through examination of our responses or unexpected thoughts, then we are poised to scrutinize and reflect upon our reactions and their personal, historical context. Bias is a feeling, inclination, or opinion that is preconceived or unreasoned. Whether it is implicit or explicit is circumstantial. Implicit racism is endemic in our culture. The vast majority of us have lived in a society with institutional segregation, unequal opportunities, and explicit racism. We bear the scars, whether we want them or not. Earlier this year I had several surgeries on my face. After one, I had to return to clinic to have the stitches removed. I was brought to the examining room and informed that the physician’s assistant would be with me in a minute. Soon the door opened, and a black woman in a lab coat walked in. I thought, “Oh, they sent in the second string!” OMG where did that come from? I silently screamed at myself, absolutely flabbergasted. And so, I see in myself another instance of implicit bias. I identify the thought for what it is, an unexpected involuntary opinion that I recognized as implicit racism. Wow! I turn it around in my mind and on my tongue, allowing myself to experience the myriad of emotions that accompany it. Horror, history, defensiveness, shame, and, finally, acceptance. Wow. It’s another version of the five stages of grief. The shock is denial; the history is the anger; the defensiveness, bargaining; the shame is the depression, and then the acceptance. “Oh my gosh, I could not have thought that.” Yes, that is what we are subtly and not so subtly taught, so, what do you expect? “I’ve been taught it all my life. I can’t believe that this thought is a part of me. But it is. It is simply a part of me that I now recognize and can adjust”. This self talk can be cathartic, relieving the system of a now conscious burden. Yet sharing the insight can also be an important part of our personal reconciliation. Let it be a joyful experience; a new learning about yourself that deepens your identity, that lifts up your values, that increases the love you have to share. In early anti-racist trainings there was sometimes an explicit or oblique directive to affirm your racism. “We are all racists and we cannot proceed in our dialogue until you admit your racism.” Perhaps you can see that this approach does not always work. Many of our racist tendencies are under our own radar. If we are unaware of them, it is definitely difficult to admit to being a racist. That does not, of course, absolve us from our work on our conscious racism, but it does support us in our search for greater understanding. Working on anti-racism initiatives affirms the principles that we hold dear: the worth and dignity of each person; treating all with justice, equity and compassion, and the goal of a world community with peace, liberty and justice for all. It is a spiritual quest: one that attempts to heal and transform the brokenness in our nation, our communities, and our hearts. Much anti-racism effort focuses on institutional racism. This important work stresses eliminating areas of systemic oppression. It is the emphasis of Black Lives Matter, Repairers of the Breach. Crossroads, Kentuckians for the Commonwealth, Solid Ground, and many more organizations. Repairers of the Breach has asked that this weekend be declared a “Moral Declaration Worship Weekend.” There are two main objectives. First, encourage your congregation to vote. Okay, this is a no brainer for UUs. As congregations we affirm the right and responsibility of a democratic process. So here is my preaching on the topic. How many of you are registered to vote? How many of you are planning to vote? Please do so. If you are undecided, talk to your faith community. Our moral traditions have a firm foundation upon which to stand against the divide-and-conquer strategies of extremists. We believe in a moral agenda that stands against systemic racism, classism, poverty, xenophobia, and any attempt to promote hate towards any members of the human family. We claim a higher ground in partisan debate by returning public discourse to our deepest moral and constitutional values. Please add your name to call on our 2016 presidential candidates, senate candidates, and governors to advance a moral agenda. So today I ask you to consider that request, a request to affirm our commitment to economic democracy, equality in education, healthcare for all, criminal justice reform and equal protection under the law. There will be a computer set up in the Social Hall if you care to sign the declaration today or you can do so online at moralrevival.org/moraldeclaration. There are things that we can do that will make our heart happy: Vote, sign petitions on items that you believe in, talk about racism in small groups and, most importantly, when incidents happen. Make it personal. Racism isn’t this abstract concept that WKU faculty discuss in their secluded, academic ivory towers. Racist incidents happen daily, not just the murders of black men. It goes on. The attendant finally understands that she is “an actual physician,” and asks to see her credentials. A white physician steps up, and the attendant says: “Thanks for your help, but he can help us, and he has his credentials.” Which of course he had not shown the attendant. This is a real-life, personal incident. Talk about it, experience the feeling. Explore its history and challenges. How do you feel when a group of young men approach you? Does it matter if they are black or white? If they have sagging pants or wife beater shirts? Talking about racism allows your conscious mind to refilter its history. You may come in contact with unexpected thoughts, emotional, yet previously unheard, opinions, blocked fears. This is good! In our congregation, we have the option for small group ministry; for workshops on racism, for engaging in several anti-racism curricula. We have the option of joining with others in activities such as Christ Episcopal Churches recent series on Sacred Conversations. If you really want to learn more about implicit racism, challenge yourself to attend a forum on racism, walk through an unknown neighborhood, join a book discussion on the topic, talk to folks who are “different” from you. Try wearing a Black Lives Matter button or bracelet. You are sure to obtain a variety of thought provoking comments. Make your heart happy. Enter into the fray and peace shall engulf you.